Ok…so you decided to manage a lacrosse team. If you’ve never done this before it can be a very overwhelming feeling. (Coaches if you haven’t found a manager yet, find a mom or dad and ask nicely…flowers/candy/BWW Gift card…nothing is overboard. You NEED this position filled!) Below are some simple hints and tips for getting started this season. Kris Eyler at exchange.brigade@gmail.com to have you assigned as the Team Manager. Teams Tab on the Brigade Site…your new best friend! Get to know your Teams Tab…this is a fantastic resource and can do many things for you. Some teams have used TeamSnap or SnapFish or any other outside source for team management, but our site is actually very handy. 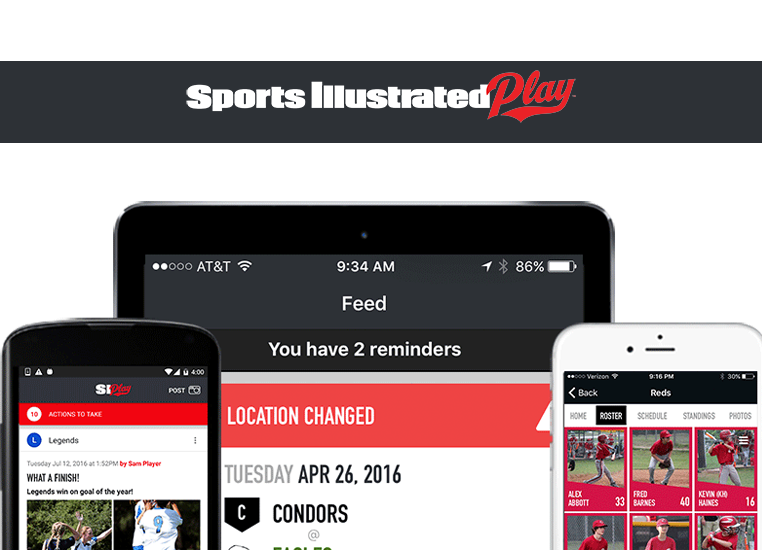 The new League Athletics mobile application is called SI Play, which is available on all App Stores and is free. The app is similar TeamSnap and the families do not have to create a new account, they just use their League Athletics username and password. Take a look and see if it works for your team. Log into your Brigade account using the Edit My Account link that’s found at the bottom of the BRIGADE HOME tab drop down list. Click on TEAMS in the top tab list. Follow the prompts and go to your team. You will see the homepage for your team on the web. As the manager you can make changes to this tab and update it as often as you’d like. Click the Green or the Yellow Square to add or edit your home page. If you want to leave something out there all the time then use the Green . If you want to just edit what’s there use the square. If you want to delete it and start fresh, use the Red Trashcan. On the right side you will see everyone that’s been added to your team. If there is an assistant missing or something is incorrect. Please email Kris to make any necessary corrections. Below that you’ll see Events. You can add practices, you can add snack assignments, you can add Team Building events, you can add birthdays…basically anything! Go hover over the TEAMS tab again and select Schedule. On the right you’ll see Options. Click it and select add event. You can add a practice (Games will add automatically when the season schedule is announced) on the tab that appears. You can add a General Event by clicking on that tab. On this page you can add the snack family for each game day. Once populated, this will show up on the team calendar. The TEAMS tab also lets you see your roster and your contact information for Coaches. If there is any information for a family that is incorrect such as phone numbers or email addresses, please ask that family to log into their personal account and make changes. It can be done at any time. What exactly did you sign up for? Team Managers can do a little or a ton. You’ll need to meet briefly with your coach to ask exactly what he/she needs from you. Below are some of the basics. You should download the Code of Conduct and Medical Release forms on the DOCUMENTS page found under the BRIGADE HOME tab. Please have every family fill them out and return to you or the coach. If you have a veteran coach they may have already started this…if you have a newbie, they probably don’t know about it. You can send this out via email to your families, or hand out hard copies at a practice. But it should be done very early in the season. These should be kept with the coach and brought to every practice just in case. You should send an email to your team introducing yourself and just letting them know you’ll be coordinating the season. You might want to mention that they’ll be requested to perform Home Team Field Responsibilities and Snacks but that you’ll provide more info on that when the schedule is announced. Once the schedule is announced…around March 15th…you’ll need to make the snack schedule. It’s up to you…have the parents volunteer for a day or assign a day and have them switch if needed. Both are acceptable…do what works for you. Publish it to your Events tab so everyone knows who’s on deck for each game. Uniforms will be distributed to Coaches the week of March 17th. You can offer to help your coach but he/she may want to handle it. Either way is fine. Once distributed, if there are size discrepancies, ask folks to trade within the team before escalating to the league for assistance. Some teams make roster cards. These are small, laminated cards with team information that can be placed on lanyards and worn by parents on the sidelines. Usual information is Kids name and jersey number and Parent’s first names. Nothing worse than cheering for the wrong kid or having to call your new friend Dylan’s mom! Help everyone get to know one another! During the season you’ll be asked to assist with Picture Day. Information will come out when that is upcoming. Feel free to set up off field get togethers for your team. Talk to the coach first to see what they think, but it’s a good way to build relationships! You’ll also be asked to talk up the fundraiser that will be announced in April. It’s going to be fantastic, take little effort and have great reward!! It will run during May and we’re VERY excited!! Towards the end of the season start to think about a gift for your coach and/or a team party. Talk to the coach about what type of party they might have in mind. Talk to your parents about a gift and what they might be thinking of. Try new things! Make this job your own. so that it can be added to this page for everyone else to follow in your awesome footsteps! Thanks for signing up for this very important role in our league!